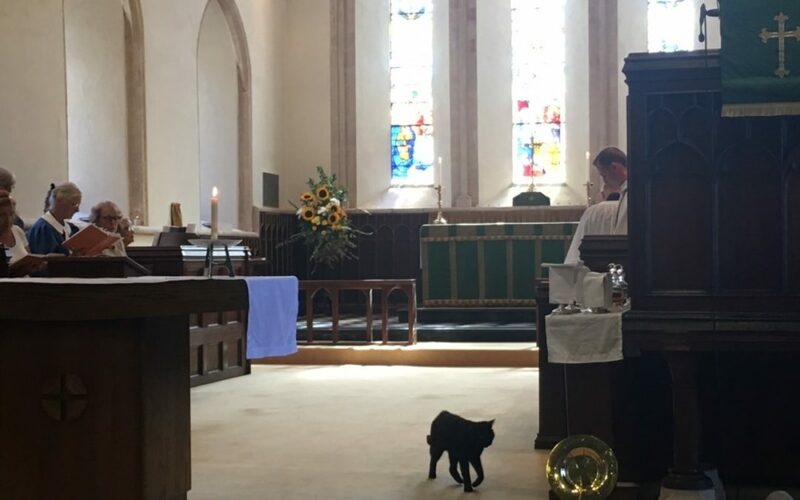 A very dignified visitor walked through the open Church door today and strolled down the aisle as though he owned the place. I’ll call him ‘Thomcat’. He was most attracted to the children and young people. As is customary, the youngsters read the Lesson and Prayers on this special day. At the first sound of their bell-like clear voices, he stood perfectly still and never took his eyes off them. Once, he walked slowly to the front of the altar, faced the lectern and never once moved and kept his eyes transfixed on the reader. Every single word of the readings was clearly heard – thank you Sunday School. Even when the whole congregation moved to form a huge circle around the inside of the building, he was not troubled. It was an unusual and enjoyable experience to have him amongst us. The Vicar gave his sermon from the middle of the Church in front of the altar – he was carrying a huge house brick – oh! not to throw at Thomcat! He asked the children to hold it and say what they thought – very heavy, strong, if together, they could make a building or a Church. Just like all of us! Rev Mark then said that he’d seen in an Enid Blyton book, references to calling characters ‘a brick’ as people did in her day. It was a great compliment to be addressed thus. If you wanted to ask anyone a favour, you would say ‘be a brick and post this letter for me’, or ‘fetch a bottle of milk’ etc. You would feel that they thought you were very reliable and approachable, as Christians try to be. Afterwards, it was off to the Vicarage’s beautiful garden where we were all invited to share in a hog roast yum-yum! It was so good to have that extra time to chat and laugh together. Another year to wait to find out whether ‘The cat comes back’!